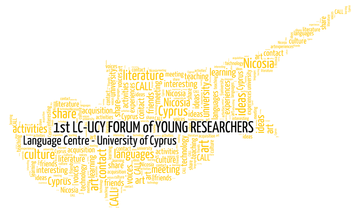 The Language Centre of the University of Cyprus is pleased to announce the 1st LC-UCY INTERNATIONAL FORUM OF YOUNG RESEARCHERS that will take place in Nicosia on June 2, 2016. The theme of the 1st Forum will be "Languages in Contact: Interconnections and Interferences". The purpose of this Forum is to promote, disseminate, and favour the exchange of results obtained by young researchers from different disciplines that are directly or indirectly engaged in the study of languages and literature. We invite contributions from any field of Linguistics and/or Literature, and we are particularly interested in studies that explore the many interferences and interrelationships among the various languages, especially in relation to language teaching/SLA. The 1st LC-UCY INTERNATIONAL FORUM OF YOUNG RESEARCHERS will be part of the VIII Training Days for Spanish Instructors in Cyprus (Jornadas de ELE in Spanish) that have been organized annually since 2009. The meeting is aimed at young researchers: those who are undertaking a final research project for their undergraduate studies, pursuing their graduate studies in order to obtain their Master’s Degree, at the stage of preparing their doctoral thesis or PhD holders in their first 5 years of their academic research career. Abstracts can be submitted in English, Spanish, French, Portuguese, German, Greek, Turkish and Italian. After the FORUM, the submissions will be edited and published in a volume with ISBN number in accordance with the academic standards for scientific publications.